New full service pizza shop to replace failed quick serve concept. 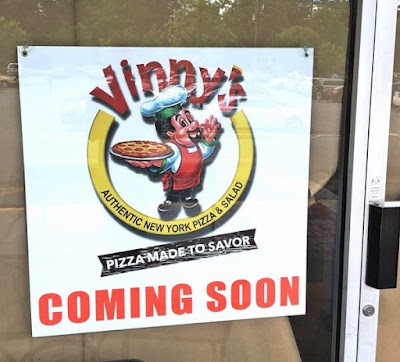 Vinny's Authentic New York Pizza & Salad plans to open in the coming weeks on Piedmont Avenue at Ansley Mall. The full service pizza restaurant replaces Uncle Maddio's Pizza, a fast casual pizza concept, which closed recently. The new pizza restaurant is being opened by the owners of Vinny's New York Pizza, an existing restaurant at the corner of Peachtree & 7th Streets, within the Spire condo building, in midtown. The group also operates an existing location of the concept coming to Ansley Mall in Duluth, near Infinite Energy Arena. A source close to the new restaurant indicated the Ansley location will offer more menu variety than the existing restaurant. Entrees such as fresh pastas and chicken Parmesan will be complement the pizza and salad-centric menu. Are you excited for Vinny's to be coming to Ansley Mall? Do you miss Uncle Maddio's? Who do think serves the best overall pizza in Atlanta? Vinny's has some of the best pizza in Atlanta! The new location will have better parking...I hope it does well! This entire city is devoid of places to buy pizza by the slice. Well, at least high quality places. "This entire city is devoid of places to buy pizza by the slice. Well, at least high quality places." There's this place called Felini's and another place called Edgewood Pizza, and another place called Johnny's Pizza, and this other place called sbarro and probably 15 thousand other places that do the same thing, so I dunno where YOU have been, maybe Atlanta, Indiana, but in Atlanta, GEORGIA there are several places to get pizza by the slice. Please broaden your horizons. No they are correct, its hard to get good slices in the ATL. Feline's, Edgewood and Johnny's are almost the same very average. SOMEONE NEEDS SOME REAL NICE SLICE OPTIONS HERE! Coolio, you broaden your horizons your way and I'll broaden my horizons mine. I don't read books because if they're any good they'll make them into a miniseries and I don't watch movies because they're full of naked people. I wonder if this is a change of strategy by Selig at Ansley. There seemed to be a big push toward franchise options when they redid the mall when the center for years was dominated mostly by local merchants. I wonder how Panera does there with so little immediate office traffic? Moes seems ok but never lined up. Ansley Mall is a strange beast. Parking lot is always full, probably due to Publix, LA Fitness and CVS, but doesn't seem to be a lot of foot traffic from nearby residential and there is hardly any office nearby to eat at fast casual places. I wonder if it will be reconfigured to take advantage of its BeltLine frontage. Plop a midrise condo or apartment building where the Bank of America/Cleaners/Jimmy John's is. I went to Uncle Maddio's a couple of weeks ago (don't judge, I had a hungry child). Their pizza was really bad, service was apathetic. It won't be missed. Vespucci's at 17th and Peachtree does a fine slice. Unfortunately Vespucci's is only open lunch hours Monday thru Friday.